So, Thrust. One of the Seekers. Starscream's classics mold had been redecoed into every single Seeker bar Sunstorm. Out of the Seekers, Thundercracker, Thrust and Dirge are all exclusives to Botcon. The latter two were retooled with new wings by Japan's Henkei line as an exclusive. So, back then, to get a Classics Thrust toy was very hard indeed, and I imagine they would fetch very high prices. The Botcon exclusive Thundercracker certainly had ridiculous prices in eBay. 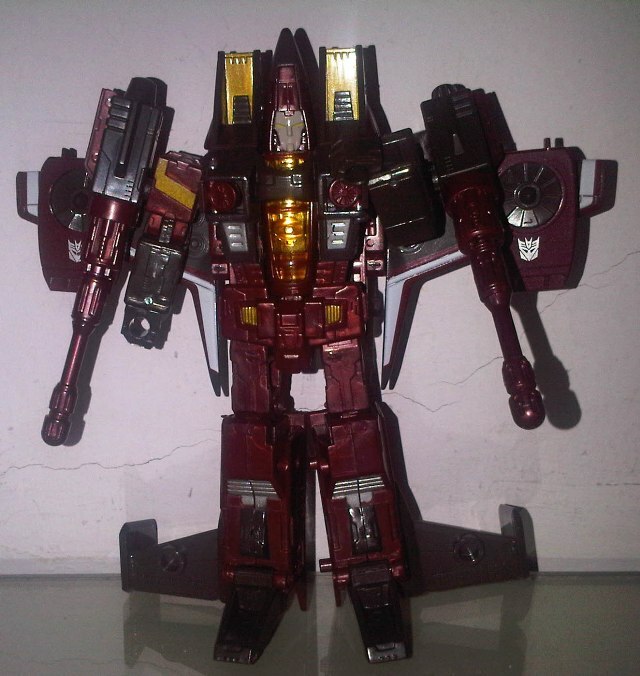 Then Hasbro had to go and release Thrust in their Generations line. Bet all those guys who bought the Botcon or Henkei versions are pissed off. Thrust was actually the last Seeker that I remember if I list them one by one. He was part of the second year of Seekers, dubbed the Coneheads by the fans because their character models had their nosecones up. The Coneheads also had new wings and weapons. Thrust is a mere bully who is actually a coward when push comes to shove. In theory, anyway... the lack of a defining story for him makes him not too memorable. He's always in the background. In the cartoon he stays in the background all the time, occasionally shooting at stuff or kidnapping handicapped human children. He got totally eaten by Unicron, but showed up later in season three. In the comics he also hangs around in the background until the writers forgot about him and he disappeared. In Dreamwave, Thrust remained mostly the same, remaining in the background and shooting at Autobots. IDW had him appear for one scene in Stormbringer, before they killed him, off-screen to boot. Poor Thrust. Name reassignment history—the name Thrust was first used as a retool of the Seeker mold. He got VTOL wings based on a real-life unused concept for a modification of the F15 Eagle fighter jet. 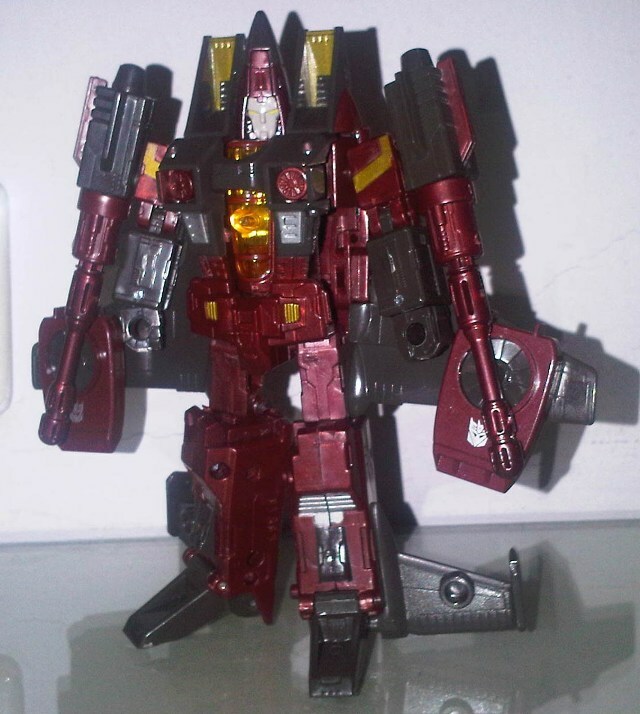 The name Thrust was then reused in Japan for a redeco of Machine Wars Megatron. He was a comedian, and was later mutated into Thrustor, a heavy retool of BW Dinobot. In Beast Machines, we had the next major Thrust, a Vehicon that was really Waspinator. Armada gave us another Thrust, a Decepticon jet that later worked for Unicron. In the Cybertron line the name Thrust was used as one of the Mini-Cons. 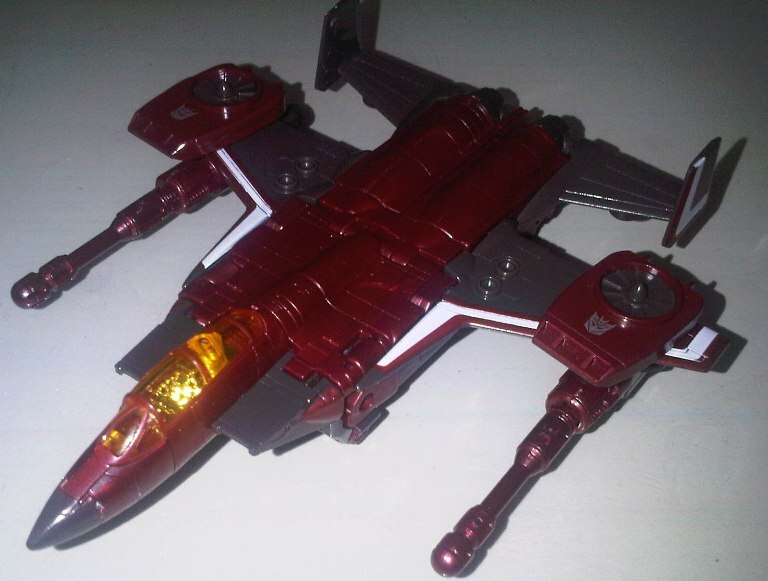 More recently Thrust was used in the ROTF line as a redeco of Breakaway. 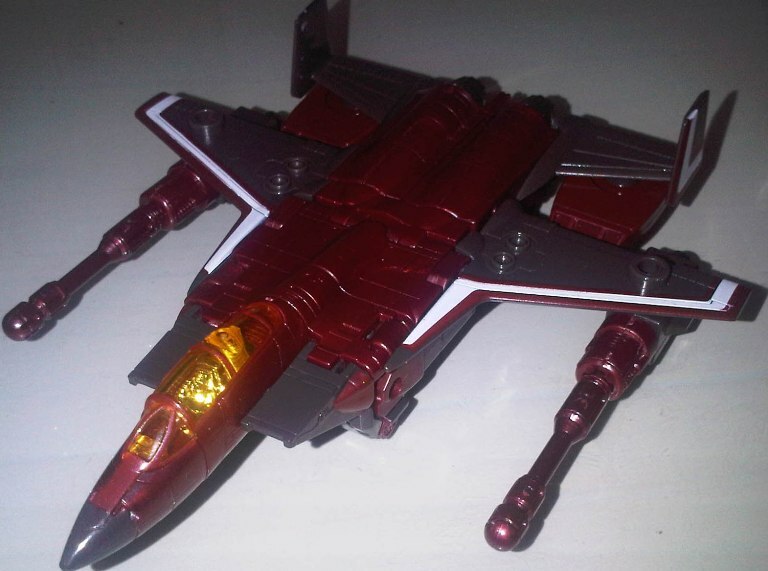 Thrust transforms into a F15 Eagle fighter jet. Compared to Starscream, Thrust has got new wings and tail parts. The wings are thinner and placed further away from the cockpit compared to Starscream's, and the tail-wings are completely different. Thrust is mainly a rusty red, with dark gray for secondary colours. The cockpit is yellow, while a trim of white completes the paint job. All in all, Thrust's alternate mode is well-sculpted, with lots of detail, including a chromed chair inside his cockpit, similar to the Henkei version. That's right—a Hasbro Classics toy with chrome. Stop the presses. The twin blasters attack to the underside of his wings. I like how they gave a slight black finish to the projectiles; it's a nice touch. The real treat, of course, is the two VTOL engines that are unique to Thrust. While he's packaged with the VTOL engines tucked under the tail wings, you can easily detach them and mount them on the main wings, just like G1. Or, if you prefer, you could mount them on the underside of the wings as well, in a more sensible manner. In the same vein the cannons can fit on the same places that the engines can. It's a pity that the turbines don't spin, though. Thrust's robot mode is well designed. Initially, I was fearful of loose joints like what my Starscream v2 has, but Thrust shows no sign of mold degradation, which is good. Perhaps it's an effect of using the Ramjet mold? In any case, though, Thrust looks great. There's not much to be said here that hadn't been said with other reviews of the Classics Seeker mold. It's well articulated, very close to the original designs both toy and character model, and well-detailed. More silver and yellow appear, brightening up Thrust's paintjob a little. Thrust's facial expression is identical to Ramjet's, that is a stern, sombre look. It's white instead of black, though. Again, like Ramjet, there are two ways that you could leave the wings. You could swing it up like the G1 toy, leading to a Thrust that really looks like his character model. This is the one that the Hasbro photographer uses, and it looks better. However, the wings are too high up, and the VTOL engines make it look a little too busy, though, especially if the cannons are attached onto the shoulders. The alternative way, if you follow the instructions, is to leave the wings as it is in jet mode (but attach the VTOL engines!). All in all, a very solid robot mode. The colour scheme is much better here than the bright Botcon one, and it's actually, for once, more show-accurate than the Henkei one. Japan might've done better toys for the other Classics figures, but Hasbro nailed Thrust. Transformation Design: 8/10 The Classics Seeker mold is well-designed, and it's really fun to fiddle around with it. The placement of the VTOL engines look better than the Botcon version, too.? Durability: 9/10 Surprisingly, Thrust's joints are very solid, unlike the looser ones on Acid Storm or Starscream v2. Be careful with the thin parts of the wings, though. Fun: 6/10 Thrust is a decent army builder. I do have a weakness for Seekers, so it depends on how you like him. Aesthetics: 8/10 Thrust looks good. Better than Starscream or Ramjet, anyway. Certainly the darker rusty red is better than Botcon Thrust's bright red, and it doesn't have Henkei's white acrobat streaks. Articulation: 8/10 Thrust has more articulation than Starscream, mainly because the wings and conehead don't get in the way. The cannons are a little too large to be shoulder-mounted, and he lacks a waist joint but it's still well done. Value/Price: 8/10 Thrust is worth your money. Definitely better than hunting for the Henkei or the Botcon ones, which are insanely expensive. If you have them, though, no need to get this one. Overall: 8/10 Not bad, really. He looks better than Ramjet, and if you're a fan of G1 Thrust this would be great for you. However, if you had earlier versions of this mold it's nothing special. It is a nice toy, though, even if the mold is overused by now. Granted, he is a nice nod to the fans who aren't willing to fork out insane amounts of money for a Botcon exclusive or a Japan exclusive.